Leah Hogsten | The Salt Lake Tribune Pallas Cat, Hal (pronounced HA-ru), birthed a litter of five pallas cats on May 26. Hal alternates between running away from the rambunctious kids and keeping them from falling off ledges. The three male and two female kittens weighed in at just over 2 lbs. at their most recent check-up. Leah Hogsten | The Salt Lake Tribune Pallas Cat, Hal (pronounced HA-ru), birthed a litter of five pallas cats on May 26. Hal alternates between running away from the rambunctious kids and keeping them from falling off ledges. The three male and two female kittens weighed in at just over 2 lbs. at their most recent check-up. Leah Hogsten | The Salt Lake Tribune Amur leopard, Jilin (JEE-lin), named after the region leopards are found in the wild plays with her mother, Zeya, in their enclosure at Hogle Zoo, Thursday, August 9, 2018. Born May 9, Jilin weighs just over 10 lbs. and has white toes just like her brothers born last year. Experts estimate only 60 leopards remain in the wild. Leah Hogsten | The Salt Lake Tribune Black-footed cat Amari, gets a quick cleaning by his mother Sanura, the oldest black-footed cat to give birth, surpassing her own record set last year in their enclosure at Hogle Zoo, Thursday, August 9, 2018. Amari was born May 18, 2018. Leah Hogsten | The Salt Lake Tribune Amur leopard, Jilin (JEE-lin), named after the region leopards are found in the wild plays with her mother, Zeya, in their enclosure at Hogle Zoo, Thursday, August 9, 2018. Born May 9, Jilin weighs just over 10 lbs. and has white toes just like her brothers born last year. Experts estimate only 60 leopards remain in the wild. Leah Hogsten | The Salt Lake Tribune Amur leopard, Jilin (JEE-lin), named after the region leopards are found in the wild plays with her mother, Zeya, in their enclosure at Hogle Zoo, Thursday, August 9, 2018. Born May 9, Jilin weighs just over 10 lbs. and has white toes just like her brothers born last year. Experts estimate only 60 leopards remain in the wild. Leah Hogsten | The Salt Lake Tribune Amur leopard, Jilin (JEE-lin), named after the region leopards are found in the wild plays with her mother, Zeya, in their enclosure at Hogle Zoo, Thursday, August 9, 2018. Born May 9, Jilin weighs just over 10 lbs. and has white toes just like her brothers born last year. Experts estimate only 60 leopards remain in the wild. Leah Hogsten | The Salt Lake Tribune Black-footed cat Amari, plays with a leaf in his enclosure at Hogle Zoo, Thursday, August 9, 2018. Amari's mother Sanura, is the oldest black-footed cat to give birth, surpassing her own record set last year. Amari was born May 18, 2018. Leah Hogsten | The Salt Lake Tribune Amur leopard, Jilin (JEE-lin), named after the region leopards are found in the wild plays with her mother, Zeya, in their enclosure at Hogle Zoo, Thursday, August 9, 2018. Born May 9, Jilin weighs just over 10 lbs. and has white toes just like her brothers born last year. Experts estimate only 60 leopards remain in the wild. Leah Hogsten | The Salt Lake Tribune Amur leopard, Jilin (JEE-lin), named after the region leopards are found in the wild plays with her mother, Zeya, in their enclosure at Hogle Zoo, Thursday, August 9, 2018. Born May 9, Jilin weighs just over 10 lbs. and has white toes just like her brothers born last year. Experts estimate only 60 leopards remain in the wild. Leah Hogsten | The Salt Lake Tribune Amur leopard, Jilin (JEE-lin), named after the region leopards are found in the wild plays with her mother, Zeya, in their enclosure at Hogle Zoo, Thursday, August 9, 2018. Born May 9, Jilin weighs just over 10 lbs. and has white toes just like her brothers born last year. Experts estimate only 60 leopards remain in the wild. At 3 months old, Jilin is still getting a feel for her new home. 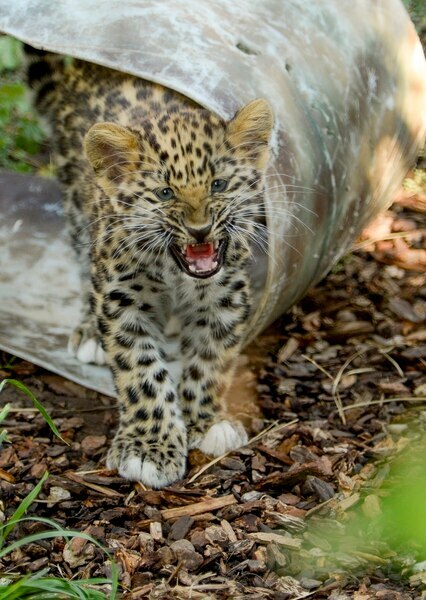 An Amur leopard born May 9, Jilin has been inside her new enclosure, in the Asian Highlands section of Utah’s Hogle Zoo, to get acclimated. But Thursday was her first official day living there, and she showed signs of curiosity and nervousness. Jilin (pronounced GEE-lin) isn’t the only kitten figuring out life at Hogle Zoo. 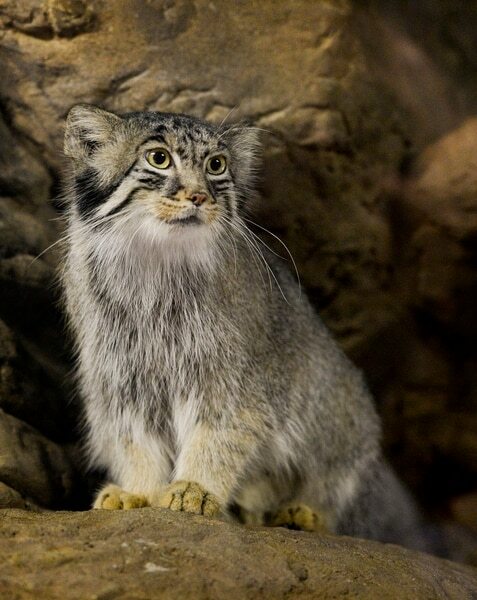 On Thursday, the zoo also introduced Amari, a male black-footed cat born May 18, and five Pallas cats — males Tashi, Kaz and Bataar, and females Pema and Nox — born May 26. The cluster of kitten births isn’t coincidence, said Marianne van Antwerp, a zookeeper in the Asian Highlands section. Mating seasons for the zoo’s felines usually run through the fall and winter, so births in the spring are a regular occurrence. Jilin darts about her enclosure, climbing up a fallen tree trunk or turning a cardboard mailing tube into a chew toy. Her mother, 6-year-old Zeya, alternates between playing with Jilin and patrolling the enclosure’s perimeter. Amur leopards are among the rarest cat species, with about 60 still alive in the wild in China and Mongolia. About 100 exist in zoos worldwide, Hogle keepers said. Accredited zoos contribute to a database — “it’s massive computer dating for animals,” zoo spokeswoman Erica Hansen joked — to match up compatible breeding pairs. Jilin, Phillips noted, has inherited Zeya’s white toes — something not normally seen with wild Amur leopards. Two male leopards Zeya birthed last year, now living in zoos in San Diego and Pittsburgh, also had white toes. Zeya is something of a celebrity among Hogle’s attractions. On June 7, 2016, Zeya briefly escaped her enclosure, and a zoo visitor found her sleeping on a rafter. She was tranquilized and returned to her area. Someone briefly maintained a joke Twitter account for her, @HogleZooLeopard. In the zoo’s Small Animal Building, Amari, the new black-footed cat, plays with his mother, Sanura. 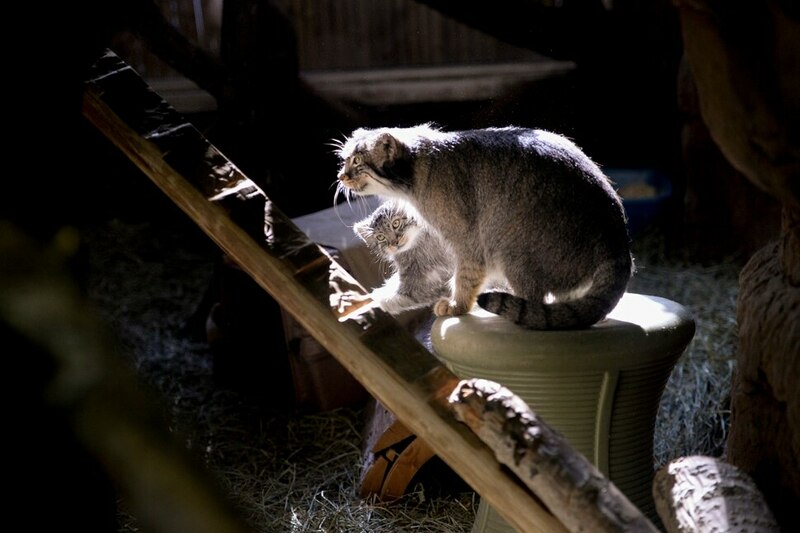 She is 13 years old, the oldest black-footed cat to give birth in captivity — breaking the record she set last year when she gave birth to a female kitten. Black-footed cats are the smallest feline species in the world, said Janice Thompson, lead keeper in the Small Animal Building. Native to the African savannas, they are among the fiercest hunters — so much so, Thompson said, that keepers don’t get in the enclosure with them if it is not necessary. Amari will play with her mother, but it’s not all in fun, Thompson said. It’s also training the kitten how to hunt the small prey — rodents mostly, but also birds and amphibians — on which it would depend for survival in the wild. “Mom will lay there flicking her tail, to encourage them to learn how to pounce and attack,” van Antwerp said. A few rooms down in the Small Animal Building, the five Pallas cat kittens are running around and tackling one another. Their mother, Hal (pronounced HA-ru), alternates between running away from the rambunctious kids and keeping them from falling off ledges. There’s no accurate count of Pallas cats in the wild, van Antwerp said, because they camouflage well in their surroundings in the Himalayas. They are believed to be endangered, because their fur — the thickest and densest among cat species — is prized by trappers, and because farmers poison rodents, which are the cats’ main prey, van Antwerp said. Hal had a litter of five kittens last year. One of them, Mushu, escaped his enclosure for a night in January and was safely recaptured. Mushu has since gone on to another zoo for breeding. This year’s kittens will likely stay with their moms through the fall, keepers said, when the breeding cycle starts up again.